The National Institute of Cholera and Enteric Diseases (NICED) building in which the Collaborative Research Center of Okayama University was established. 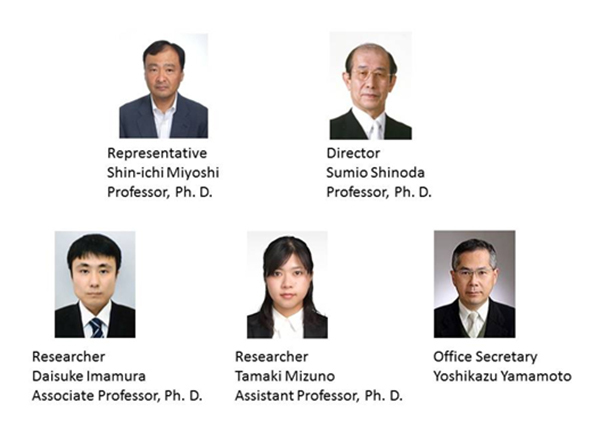 Staff of the Collaborative Research Center of Okayama University. 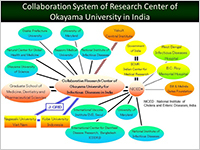 Links with the Collaborative Research Center of Okayama University. 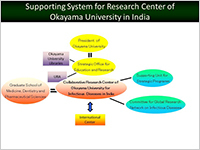 Supporting system for the Collaborative Research Center of Okayama University. 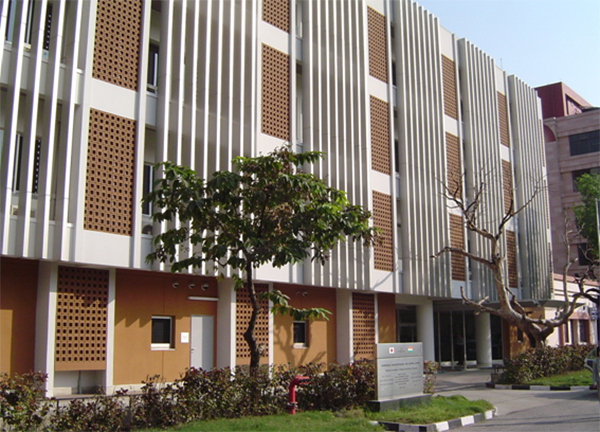 The Collaborative Research Center of Okayama University for Infectious Diseases in India (CRCOUI) started up in 2007 at the National Institute of Cholera and Enteric Diseases (NICED) in Kolkata, India. CRCOUI is one of the research centers of the “Japan Initiative for a Global Research Network on Infectious Diseases: J-GRID”, which has been governed by the Ministry of Education, Culture, Sports, Science and Technology (MEXT) of Japan. It was transferred to the control of the newly established “Japan Agency for Medical Research and Development: AMED” in April 2015. The major causes of death in developed countries including Japan are so-called lifestyle-related disease or non-communicable diseases (NCDs), such as malignant tumor (cancer), heart disease and cerebral apoplexy. However, infectious diseases are still responsible for a high number of mortalities in developing countries, especially among children under the age of five. World Health Statistics published by the World Health Organization report a high percentage of mortality from infectious diseases such as HIV/AIDS, diarrhea, measles, malaria and pneumonia in children of South and Southeast Asian and African countries, which prompted the establishment of J-GRID. One example of how infectious disease continues to claim lives is diarrhea, which accounted for 15% and 10% of total deaths among children under the age of five in India in the years 2000 and 2013, respectively.As a result, the main project of the CRCOUI is concentrated on diarrheal disease research. Three Okayama University researchers and one office secretary reside in the center and carry out the following research themes in collaboration with NICED staff. 1. 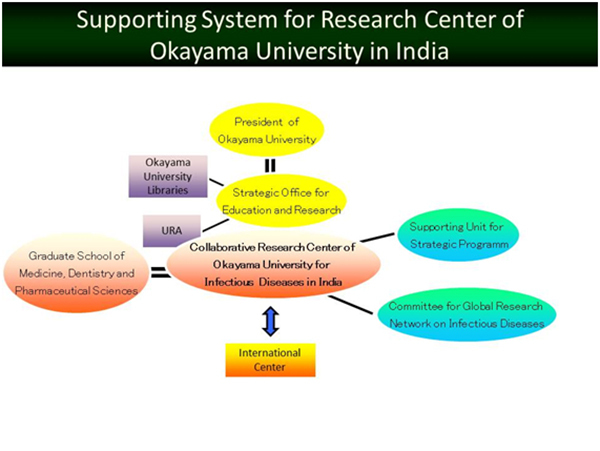 Shinoda S, Imamura D, Mizuno T, Miyoshi S. Activity of Collaborative Research Center of Okayama University for Infectious Disease in India. J Disast Res. 9:774-783 (2014). 2. Barman S, Koley H, Nag D, Shinoda S, Nair GB, Takeda Y. Passive immunity with multi-serotype heat-killed Shigellae in neonatal mice. Microbiol Immunol. 58:463-466 (2014). 3. Mizuno T, Nanko A, Maehara Y, Shinoda S, Miyoshi S. A novel extracellular protease of Vibrio mimicus that mediates maturation of an endogenous hemolysin. Microbiol Immunol. 58:503-512 (2014). 4. Ramamurthy T, Ghosh A, Pazhani GP, Shinoda S. Current perspectives on viable but non-culturable (VBNC) pathogenic bacteria. Frontier Publ Health. 5:1-8 (2014). 5. Miyoshi S, Ikehara H, Kumagai M, Mizuno T, Kawase T, Maehara Y. Defensive effects of human intestinal antimicrobial peptides against infectious diseases caused by Vibrio mimicus and V. vulnificus. Biocontrol Sci. 19:199 (2014). 6. Imamura, D., Mizuno, T., Miyoshi, S., Shinoda, S. Stepwise changes in viable but nonculturable Vibrio cholerae cells. Microbiol Immunol 59: 305-310 (2015). 7. 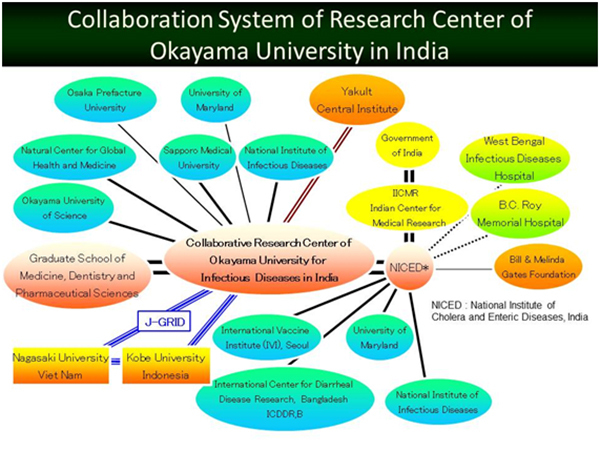 Shinoda S, Imamura D, Mizuno T, Miyoshi, S, Ramamurthy T. International collaborative research for infectious diseases of Japanese universities and institutes in Asia and Africa, special emphasis on J-GRID. Biocontrol Sci, 20: 77-89 (2015).